Since we’ve had so much fun in the last year and a half on this crazy ride called parenthood, we’ve decided to double our fun at twice the price. We are pleased to introduce the latest category in our blog world: Round Two! Estimated completion date: February 28, 2012. The journey was planned a few months prior but it did not gain any traction until May. 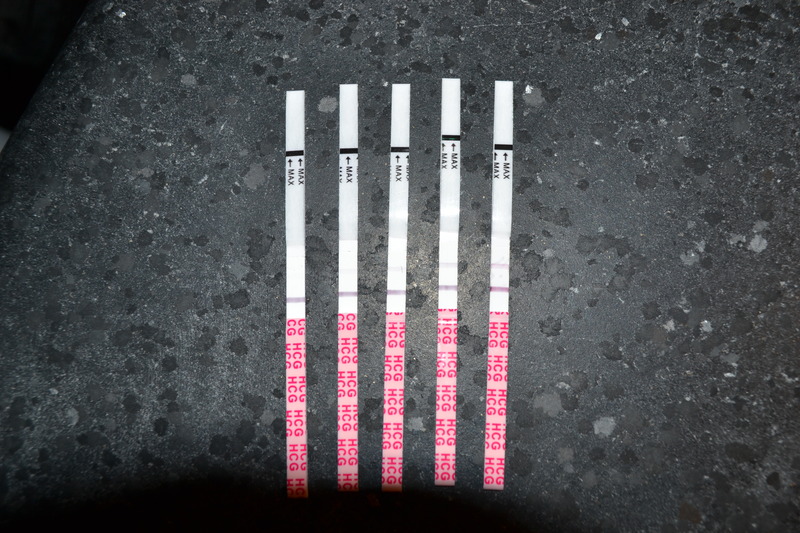 Armed with an arsenal of a 3-week supply of ovulation tests AND a 25-pack of home pregnancy tests, I decided to let science take the helm to pinpoint exactly when Magic Time was supposed to be and then let hope take over from there. Hope is what made me test 5 days earlier than I should have. But wouldn’t you know it, with pee in cup and hope in hand (not to be interchangeable), we got the faintest positive result in the earliest timeframe I have ever imagined. But what to do with the other 24 tests and all this time at my disposal? Well, I spent the next 5 days testing first thing in the morning and gleefully watched the second line getting darker every day and then gifted another 5 to a fellow mommy-friend tentatively boarding the baby train. That leaves 14 more tests to the highest bidder! This round is already so different from the first. While I’m excited and already spending increased time on pregnancy websites, I just feel more level about it all. I still have my bouts of worry and anxiety (“what is that cramp about? why aren’t I feeling more symptoms?”) but I can write it off as “normal”, which I couldn’t do the first time around. The time between calling the OB’s office and my first prenatal appointment wasn’t as excruciating. Even the ultrasound picture wasn’t as good as I remembered with Maxon but we did get to see the little heart beating, which was really the biggest thing I was waiting for. I think I feel more tired than I did at this stage two years ago, which I can easily blame on short-term memory or a 20-month toddler running around. Speaking of big brother, we’ve taught him the answer to “where’s the baby” is Mommy’s belly but apparently there is also a baby in Daddy’s belly and his own. I think I like the idea of that. This entry was posted in Round Two. Bookmark the permalink. The best news of the year!!! Maxon going to be a big brother … I am just as excited as you are! Thank you Mike and Melanie for a second grandchild. Love you both. yea! The second time is cool, because you know what to expect, and cool because it is all still so different! congrats!